Looking for a new blonde hairstyle? Just not sure what will suit you? Upload your picture and try on a new hairstyle, see if suits you? See what you and your friends would look like with famous blonde hairstyles of a Pop Star, Talk Show Host, Actress, Reality TV Star, and many more! Hairstyles from the 60s, 70s and 80s. • Free hairstyles in various lengths to try on. • Option to buy style packages with more than 120 hairstyles in total. • Take a photo, Use your photo album. • Use Facebook photos, even of friends, post to your wall. • Post in Twitter too, if you wish. • Understand what suits your face shape. It’s all about blonde girls? The new season is going to be an experimenting one. This year is rich with different hairstyle trends. Beautiful hair is a must have of every woman, that’s why you always have to follow fashion and underline your beauty and style. Download and check out the long hairstyle ideas now. So try on a new hairstyle and avoid a hairstyle disaster! I was looking for an app that shows what blondes will look good on me. This is the only app that actually worked. Needed to figure out what I like and lol good in It does what I need. Beautiful app you use own photo which gives you a better view of what you will look like with different lengths, colors, and styles. I just love it! Wonderful way to look at new styles! 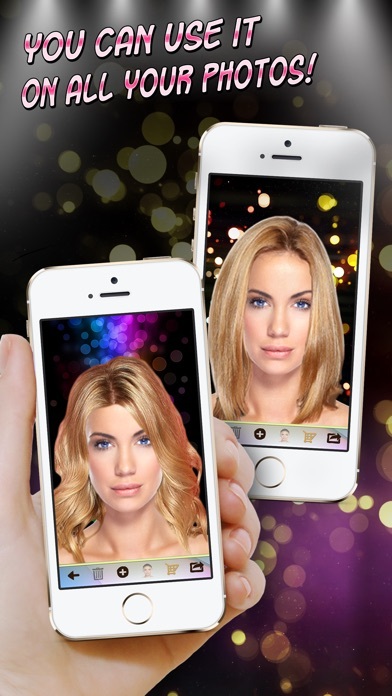 You HAVE to dl this app if you’ve never been a blonde but wanna try it out first BEFORE making the big decision!! This app is pretty fun too use! Love this site.. so much fun! I was thinking of going blonde and this app gives a good picture of it!